Take what the day offers! Boston Take What the Day Offers. You have to love hearing Desiree Linden talk about her thoughts of dropping out in the early miles. It was not her day and she was willing to adjust. As the miles accumulated she started feeling better while the other contenders were going from good to bad to DNF. The longer the race the more likely your fortunes can change, and maybe more than once. Stick with it and see what happens. If at the elite meeting on Sunday, it was announced that 2:15:58 and 2:39:54 would be the winning times, there would have been a massive shift in race strategies. You just don't know until you see how the race unfolds. Boston Opportunity Look for the opportunity in difficulty. 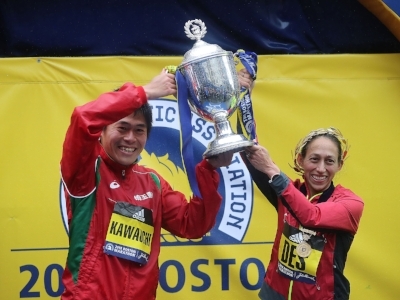 Some of the top finishers in Boston would have never been there under good conditions. If you can wake up to a rough race day and see the opportunity for those that run hard and run smart you might just surprise yourself at the end. London Reality Check Let's look at the men's race with a good sized lead pack in the early stages. These are the projected times at the following checkpoints. Keep in mind the world record is 2:02:57/4:41 per mile. 5K 1:56:27, 10K 1:59:29, 15K 2:01:10, 20K 2:01:58, 25K 2:02:31, 30K 2:02:56, 35K 2:03:37, 40K 2:04:04, Finish 2:04:17. The average pace was 4:45 and only 2M in the first half and only 4 in the first 20M were at that pace or slower. Somebody in that pack might have thought about the carnage to be had if they would have run a more reasonable pace. The only way that race plan works is if all of your competitors get sucked along into the unrealistic pace. Being the Olympic Champion and one of the best marathoners ever does not hurt either. The women's race had fewer on suicide pace, but one dropped out and the other went from 1st to 5th and 5:56 behind the winner. And she is the women's only world record holder. Sometimes confidence is pushing harder and other times it is holding back. Boston Train in it All. As much as we hate extremes you have to train some amount in it all to be ready when it lands on race day. I don't think you can get acclimated to some extremes like cold rain and wind, but you can know what apparel works best and to have the confidence you've done it before. Even the elite athletes were unprepared wearing sails for jackets and trapping in sweat and rain under too many clothes. There was no way to be comfortable in those conditions, but practice does get you closer. London Train in it All. It was not hot, but it was warmer than most were ready to handle. I tend to think 60-70 degrees in the most dangerous in a marathon. It does not feel hot enough to know you have to change plans until it is too late. Knowing and practicing race nutrition for such occasions turns such a day into a B+ performance rather than a race best forgotten. These are a few of the lessons from the last few weeks. There are many more if you look closer. Uncontollable variables have no respect for your resume. Newer PostLast Call - Mile Run!